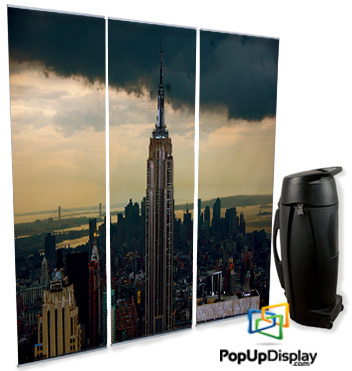 Columbia, SC -- 05/22/2013 -- PopUpDisplay.com has added 3 and 4 banner stand sets to their existing store. These banner stand sets are a great alternative to an eight and ten foot pop up displays in showcasing your products at a trade show or conference. They offer the same convenience of set-up as they can be assembled within couple of minutes. Banner stand sets offer optional lighting to highlight your offerings similar to the pop up displays. In addition, most of the 3 and 4 banner stand sets are lighter than the pop up displays offering ease of transportation. The 3 and 4 banner sets can be placed together in a convenient hard case for further ease of transportation. Since the total weight of 3 banner stand is less than 50 lbs, they can be transported as a regular luggage on an airplane. An advantage of these banner stand sets is price. For just under $500, one can have custom printed full graphic set of 3 banner stands . This is a 30-50% savings over full graphic pop up displays. The biggest benefit of buying these banner sets is its reusability. Once the conference is complete, these banner stands can be separated and added to conference rooms and lobbies. These displays will continue to advertise your products and their benefits to your visitors. Further, replacement graphics enhance sustainable reuse of these displays. Just like pop up displays, you can order replacement graphics from PopUpDisplay.com at time of your next shop. “It is exciting to offer a more convenient alternative to pop up displays at a better price. These banner stand sets offer incredible value as they can be carried as regular luggage and best of all, they can be used in existing place of work after a conference is done,” stated Sameeksha Bhargava. PopUpDisplay.com, a company in the printing business for 45 years, operates an ecommerce store specializing in pop up displays. Using digital printing, the company produces numerous types of displays, for trade shows and other events. Company is proud to provide superior customer service, quality printing on a timely basis and at a reasonable price.